Can Microsoft Excel formulas be easy to learn? Yep! This tutorial explains the very basics of Excel formulas for beginners, with detailed steps on how to write and use them. It also provides a number of advanced formula examples for experienced users. You will be amazed how simple creating formulas in Excel actually is. If asked what Microsoft Excel is about, what would be your answer? Right, it's all about storing and crunching numbers. You can use Excel to calculate percentages and compound interest, count and sum cells based on specific criteria, find average, and even get a sample deviation of a given set of values. All this can be done by using Excel formulas. In MS Excel, formulas are equations that perform various calculations in your worksheets. Though Microsoft has introduced a handful of new functions over the years, the concept of Excel spreadsheet formulas is the same in all versions of Excel 2016, Excel 2013, Excel 2010, Excel 2007 and lower. All Excel formulas begin with an equal sign (=). Press the Enter key to complete the formula. Done! Constants - numbers or text values that you enter directly in a formula, like =2*3. Cell references - reference to a cell containing the value you want to use in your Excel formula, e.g. =SUM(A1, A2, B5). Names - defined name for a cell range, constant, table, or function, for example =SUM(my_name). Functions - predefined formulas in Excel that perform calculations using the values supplied in their arguments. Operators - special symbols that specify the type of operation or calculation to be performed. Arithmetic - to perform basic mathematical operations. Comparison (logical) - to compare values. Concatenation - to join text values into a single string. Reference - to make rages and separate arguments in Excel functions. These operators are used to perform basic mathematical operations such as addition, subtraction, multiplication, and division. For example, formula =A1=B1 returns TRUE if cells A1 and B1 contain the same value (number, text or date), FALSE otherwise. For more information and examples of using comparison operators in MS Excel formulas, please check out the following tutorial: Excel logical operators - equal to, not equal to, greater than, less than. Text concatenation operator in Excel is the ampersand symbol (&). You can use it to join two or more text strings in a single string. The same result can be achieved by using the CONCATENATE function, and the following tutorial explains all the details: How to combine text strings, cells and columns in Excel. To supply rages to MS Excel formulas and separate arguments in Excel functions, the following operators are used. Colon (:) - it is a range operator that allows you to make one reference for multiple cells located between 2 cells that you specify. You can also refer to the entire column (A:A) or the entire row (1:1). For example, the following formula finds the total of all numbers in column A: =SUM(A:A). Find more about whole-column and whole-row references. Comma (,) - is used to separate arguments in Excel spreadsheet formulas. For example, the formula =IF(A1>0, "good", "bad") reads as follows: if A1 is greater than zero, return "good", otherwise "bad". Note. Comma is the default List Separator in North America and some other countries. In European countries, comma is reserved as the Decimal Symbol and the List Separator is usually set to semicolon (;). In this case, you need to separate a function's arguments with semicolons, e.g. =IF(A1>0; "good"; "bad"). So, if you are trying to make a formula in your worksheet, but Excel does not accept it and throws up an "invalid formula" error, go to your Regional Settings (Control Panel > Region and Language > Additional Settings) and check what symbol is set as List Separator there. It is that symbol that you need to use to separate arguments in your Excel formulas. For a real-life formula example, see how you can do two-way lookup in Excel by using named ranges & space operator. Further on in this tutorial, you will find the detailed steps for making both types of Excel spreadsheet formulas. As already mentioned, any Excel formula starts with the equal sign (=). So, whatever formula you are going to write, begin by typing = either in the destination cell or in the Excel formula bar. And now, let's have a closer look at how you can make different formulas in Excel. When you have some experience with simple Excel formulas, you may want to perform several calculations within a single formula. And the following examples show how you can do this. To calculate the 10% commission, you need to multiply the total by 10%, so you enclose the previous calculation in brackets, and got the result you want. Of course, nothing prevents you from multiplying the total already calculated in column E by 10%, in this case the formula would reduce to a simple calculation =E2*10%. However, in large worksheets, it makes sense to write independently calculated formulas, so that removing a column with one formula wouldn't break the others. In Microsoft Excel formulas, nesting one function within another means using one function as an argument of another function. In modern versions of Excel 2016, 2013, 2010 and 2010, you can use up to 64 nested functions. In older versions of Excel 2003 and lower, only up to 7 levels of functions are allowed. For the detailed explanation of nested IF's syntax and advanced formula examples, please check out the following tutorial: Using nested IF functions in Excel. Array formulas in Excel are advanced aerobatics. A single Excel array formula can perform thousands of calculations and replace hundreds of usual formulas. Learning array formulas certainly requires some time and effort, but it's worth it. Since this tutorial is purposed for beginners, I won't intimidate you by the definitions of array constants and complex multi-line formulas. I'll show just one very simple example of an Excel array formula that demonstrates what they are capable for. Supposing you have 2 columns of numbers, column A and B. And you want to know how many times column B is greater than or equal to column A when a value in column B is greater than 0. Note. To enter an Excel array formula correctly, you have to press Ctrl+Shift+Enter instead of conventional Enter stroke. Excel array formulas, functions and constants - explains the basics of array formulas and shows how to use array constants and array functions. Excel array formula examples for beginners and power users - 7 fascinating examples of advanced array formulas in Excel. Such custom functions are called User Defined Functions (UDFs), and they are especially useful for advanced mathematic or engineering calculations. Like macros, user defined functions are written in VBA (Visual Basic for Applications). As an example, you can review and download custom functions created by our team to count and sum cells by color. There exist 3 types of cell references in Excel: absolute ($A$1), relative (A1) and mixed ($A1 or A$1). All three of the above references refer to the same cell, and the dollar sign ($) is used only for one purpose - it tells Microsoft Excel whether to change or not to change cell references when the formula is moved or copied to other cells. Absolute cell reference ($A$1) - the $ sign before the row and column coordinates makes a reference static, and lets you copy a formula without changing references. Relative cell reference (A1) - a cell reference with no $ sign changes based on relative position of rows and columns in a spreadsheet. Absolute column and relative row ($A1) - the $ sign in front of the column letter locks the reference to the specified column, so the column never changes. The relative row reference, without the dollar sign, changes depending on the row to which the formula is copied. Relative column and absolute row (A$1) - the row's reference locked by $ doesn't change, and the column's reference does. The following image shows how different reference types work in practice. For more information about Excel cell reference and more formula examples, please see Why use $ in Excel formulas - absolute and relative cell references. 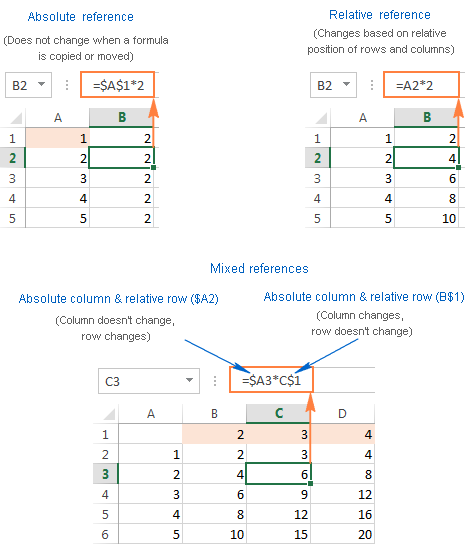 To toggle between absolute, relative and mixed references in a formula, use the F4 key as demonstrated in Switching between reference types in Excel. To view all formulas on the sheet, click the Show formulas button on the Formulas tab > Formula Auditing group or press the Ctrl+~ shortcut. To edit a formula, press F2, or double click a cell, or click the formula bar. To debug formulas in Excel, select a formula part and press F9. This will let you see the actual values behind cell references. the fill handle). Double click that cross, and you will get the formula copied through the entire column. To convert formulas to values, select all cells with formulas that you want to convert, press Ctrl+C to copy those formulas, then press Shift+F10, then press V, and then hit Enter. Shift + F10 + V is the shortcut for Excel's Paste special - values only. If you are not sure you will remember this shortcut, then simply press a usual shortcut for paste Ctrl+V, click the small arrow to the right of the Paste button to open the drop-down list, and select Paste Values. For more information, see How to replace formulas with their values in Excel. Excel provides formulas for almost anything, and there exist tens or even hundreds of different functions in modern versions of Microsoft Excel. So, if you encounter a task for which you cannot work out a solution, most likely you are missing out on a formula that can do it for you. Before spending hours and hours on performing manual calculations, take a few minutes to review the following resources. It is a selection of the most popular MS Excel formulas with examples, grouped by categories. How to calculate percentage in Excel - a few examples of percentage formula for Excel such as calculating percentage of total, calculating percent change (percentage increase formula), formula to calculate amount and total by percentage, and more. Compound interest formula in Excel - shows how to calculate daily, monthly, and yearly compounding. How to sum a column in Excel - 5 ways to sum a column in Excel. SUMIF formula in Excel - formula examples to conditionally sum cells. SUMIFS formulas in Excel - sum formula to add up cells based on more than one criteria. 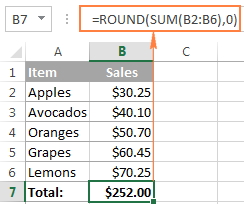 Excel SUM in array formulas - how to use the SUM function in array formulas to add up values with multiple AND criteria. COUNTIF formula in Excel - formula examples to conditionally count cells based on exact and partial match, count duplicates and unique values, and more. COUNTIFS formula in Excel - count cells with multiple criteria. How to calculate average in Excel - formula examples of AVERAGE, AVERAGEA, AVERAGEIF and AVERAGEIFS functions. Calculating moving average in Excel - formula examples to calculate a simple moving average in Excel for the last N days, weeks, months or years. Weighted average formula in Excel - two easy ways to calculate weighted average in Excel, by using the SUM and SUMPRODUCT functions. How to convert text to date in Excel - a handful of formulas to convert text to date. How to convert Excel date to text - formula to cover a date to a text string in a specified format. Excel DATE formula examples - how to get a serial number representing a date, add and subtract dates in Excel, return a date based on values in other cells, convert a text string to a date, plus a few advanced Excel DATE formula examples. Formulas to calculate days in Excel (WEEKDAY, DAY functions) - date formulas to return a day of week from date, get the number of days in the year, find how many days are between two dates and more. How to calculate months in Excel (MONTH and EOMONTH functions) - examples of Excel date formula to extract month from date, get the first and last day of the month, convert month name to number and more. Calculating week number in Excel (WEEKNUM function) - how to use date formulas in Excel to get week number from date, convert week number to date, get a week number in a month, sum values by week number, and more. How to add and subtract dates in Excel - date formulas to add and subtract days, weeks, months and years. How to calculate difference between two dates (DATEDIF function) - Excel date formula to calculate difference between two dates in days, weeks, months or years. Calculating weekdays in Excel (WORKDAY and NETWORKDAYS) - using date formula in Excel to calculate workdays with custom weekend parameters and holidays. Convert date to year & calculate age from date of birth - Excel age formulas, and a few other date formulas to extract year from date, convert date to month and year, determine leap years. How to use NOW and TIME functions to insert time - formula examples to insert today's date and time in Excel as a dynamic automatically updatable value and static unchangeable timestamp. Convert time to decimal number, hours, minutes or seconds - variety of formulas to change time to decimal number, hours, minutes or seconds, convert text to time and vice versa. How to calculate time in Excel - a few formulas to add and subtract times, calculate time difference, elapsed time, and more. Excel VLOOKUP tutorial for beginners - explains the basics of Excel's VLOOKUP function and provides a number of formula examples to do vlookup from another worksheet and a different workbook, VLOOKUP formula with wildcard characters, vlookup with exact and approximate match, etc. How to use VLOOKUP & SUM or SUMIF functions in Excel - advanced Excel formulas to look up and sum values based on one or several criteria. Advanced Excel VLOOKUP formulas - examples of two-way lookup, nested vlookup with multiple criteria, and more. Excel formulas for conditional formatting based on another cell value - formulas examples for text and numeric data. Formulas to conditionally format dates and time in Excel - how to differentiate between weekdays and weekends, highlight public holidays, display a coming deadline or delay, and more. Well, we seem to have finally got to the end. What was planned as a short Excel formula tutorial for beginners has nearly turned into a voluminous manual because there are so many different aspects of Excel formulas to cover. I am really thankful to everyone who has read this page to the end! 106 Responses to "Microsoft Excel formulas with examples"
Dr sir,I ask a reply my querry as follows:IF(A15800 & 300 if B1<5800.Pls let me know the formula. What is the two types of components of formula that start in Letter O? Please Send All Formula use excel sheet. Very good stuff. I have learnt a lot. 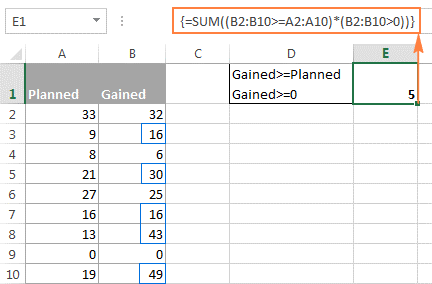 Column B gets 2500 Column C gets the difference I want Column d & E to calculate %. I also want to be able to change $ amount in B and have the $ amount and % automatically change based on whether I change $ or % amounts. please can someone solve for me this because these five students did the exam and these are their max. so what i need is can someone show me how to get MAX value,MIN value,AVERAGE value,POSITION value,GRADE value and RANK values. Thanks or your assistance in advance. if i have total amount 1000 which include 17% tax i need the true amount so what was the formula. pls i wish to know the formulas for business account. hi. I have had a hard time making formula for the following problem in excel. can someone help? please give me the true formula. if F15 is within 0.26-0.75 and H15 is above 0.20 the value returns to "retained"
if F15 is within 0.26-0.75 and H15 is below 0.20 the value returns to "revised"
if F15 is not within 0.26-0.75 and H15 is above 0.20 the value returns to "revised"
if F15 is not within 0.26-0.75 and H15 is below 0.20 the value returns to "rejected"
I will be glad to your right response. thank u.
I swear its glitching. Actual formula keeps changing. Dr sir you hereby requested to please avail me the latest examples for Excel. It was helpful. I want to get the total employee who has a salary of 1,000 - 5,000(example) how can i formulate it? thanks in advance!! You can use the countifs function for this. I need to know how to: input numbers, each in its own cell.I have a formula which I execute in a cell. I make a PDF file for others to view. I want to see the numbers that were used in the formula to be automatically inputted into a written formula.I want this formula to be written out and shown in a cell. This will show viewers the formula with numbers that was used in execution of the formula. If I want to add C1 & C3 and display the result in C3? For more information and formula examples, please see How to calculate percentage in Excel. I need help with a formula, I'm trying to come up with a formula that will calculate in the same row two possible different operations. I am having trouble figuring this one out. I'm trying to get I34=0 when cell F34=0 but when F34>160 I need it to put what is in Cell H34. I am working on splitting a track of land into parcels. The track of land has an amount money tied to it. Each parcel will be split from the larger whole based on acres. The money will then be split based on the acres of the parcels. Setting up the excel formulas isn't the problem. I seem to be ending up with more money than I started with. How is that possible? Is this a decimal issue? I end up with about $117 more than the whole started with. what is the formula for this in Ms exel "(8.3*10^3)/9"
well ive gotten the needed basics in Excel and congratulate the examples,formula etc,thanks Google. please create the simplest way how to calculate different calculations! Then copy the formula down along column F to see all the matching values for Vehicle 700. You can find more details how to Vlookup to return multiple matches in this blog post. Credit card outstanding is 1000 usd (for example) he/she have to pay minimum bill 50 USD or 2% whichever is higher. please need your cooperation . above data is in horizontal i.e. in rows. number defined are overtime hours. how to sum for each location. how to Calculate Gst Percentage Amount in below 1000 rupees and Above 1000 rupees ? how to Calculate 1000 Rupees Above 12% and below 1000 Rupees is 5% . Where "Before MRP Value" is in column A. It says, "If the value in A5 is less than or equal to 1000 then multiply it times 5%, otherwise multiply it times 12%." please how do i calculate this in excel. Take the "In" out of the formula. =0.98*(1/0.98)+0.02*(1/0.02)&" In". Not the space before the "In". I am entering 10 in cell B4 after entering the value the result should be 500*10bin the B4. The formula looks as though it should be =SUM(B1:B5). It will sum the values in cells B1 through B5. Iam facing a problem in excel, I have two excel sheets column 1 in both sheets having same data but small variation like product name in one sheet Q18nuxa2- lhj and in other sheet q18nux -lhf but I want replace total data in column 1 of sheet1 with sheet 2 data. Any formula or shortcut keys i have a bulk data . so please help me any tips. Ablebits has an article as well as some code to convert numbers to words. Be sure to check out the comments for some fixes and modifications to enable the code to work with different currencies. B=30000 and write a and b or other variables in excel and perform mathematical operations. I WANT WRITE TWO OR THREE NAMES ON A SHEET IN COLUMN A. I WANT TO KNOW THAT HOW TO CALCULATE THE NAME. in such case which excel formulae can be used. What is the function FPPRA calculating? Meaning, how is the result of (d,j) calculated? Obviously this is wrong but im not experienced enough to correct it. Basically i have column B with a name And Column H with either "Yes" or Blank. I need to write a formula for if theres The name and Yes in column H. it equals 1 on a different sheet. How can I write an average function using two columns example I what to find the average of column e7 to e55 and I 7 to i 55. both columns are figure to get one average. it carries 4 marks how can i leave that one and the exam is 60 only and duration is 2 hours but we get three hours and this type of question we cannot ask any one cause it is very big answer. NOW MY QUESTION IS WHAT WILL BE THE FORMULA OF A ITEM LIKE APPLE AFTER FEW DAYS LATER HOW THE RATE WILL COME AUTOMATICALLY?